It was Christmas Eve, and Takeshi Clifford decided it was probably time to do a little shopping for gifts. “I guess I’ll head to Best Buy and hope for the best,” he said, acknowledging his procrastination. You’ll forgive Tak, as most know him, for being a bit lax ahead of the holidays. He’s had a lot on his plate. 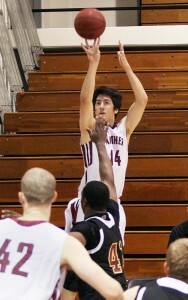 The senior is a forward on Chapman University’s basketball team and is having a solid season thus far. Frankly, the fact that he’s having any season at all is a true blessing for all involved – including his late mother, Julie. Not that anyone forced him out of basketball; he simply walked away, in the prime of his life, at the peak of his abilities. He quit the team, withdrew from school, and assumed a role most young men in his situation will likely never need to consider. “It was really all about keeping things normal,” Clifford explained. His mother was becoming increasingly debilitated by the ravages of cancer in the winter of 2010-2011, and he felt – as the first-born son – it was his duty to begin assuming the tasks that Mom had always handled. As the second semester of his junior year approached, Clifford informed Chapman head coach Mike Bokosky that he would be leaving the team for an indeterminate amount of time – and dropping out of school. Clifford took a clerical job at a law firm in Irvine and assumed command of the daily household business. 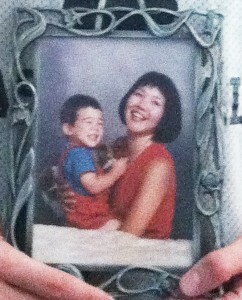 “She wouldn’t have wanted us to just sit around,” Clifford said of his mother, Julie. Clifford’s younger brother, Conor, was a senior at Ocean View High School in Huntington Beach, and having grown to nearly seven feet, was attracting a lot of attention from colleges and universities. Tak explained that Conor hadn’t shown an inordinate level of promise until late in his sophomore year, but that he’d long had a bond with his family that revolved around sports. Knowing how losing that bond with his mother might affect Conor, Tak stepped in, coaching, mentoring and encouraging his “little” brother to continue to excel – at the expense of his own athletic achievement. He sat out the entire 2011-2012 season, but not without reward. Well, indeed. Conor is now in his first semester of a full, four-year athletic scholarship at UC Irvine, playing for the Anteaters. In 13 games, he has scored 43 points, pulled in 29 rebounds and has a free throw percentage of .818, an astounding mark for a 7-foot center. Conor’s success comes down to talent and hard work, but also to the solid foundation established by his parents and – when it really counted – his older brother. A sparking career in college and a future in the professional ranks all remain entirely within reach. 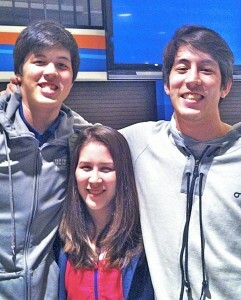 Athletic excellence: the Clifford kids, from left, Conor, Allison and Takeshi. Julie Clifford succumbed to her illness on March 24, 2011, leaving Tak and his family with a host of uncertainties to compound his grief. But he knew that his mother wanted him back on the court, so before the start of the current school year, he went to see Coach Bokosky. “It was really tough for him,” Bokosky said. “He was working for a living and taking care of his family, but we kept in touch and we’re thrilled to have him back. Clifford said the coach welcomed him back with open arms. The return has been a productive one for Clifford. His statistics on the Chapman Athletics website list 72 points over his nine starts, with an average of eight points and almost two-and-a-half assists per contest. He has scored in double figures three times this season, including a 16-point performance against La Sierra in November. Clifford said the Panthers’ 5-5 overall record fails to show the potential his team has. Chapman seems to be turing things around, as they were 2-1 in conference play heading into Sunday’s game against Santa Cruz. When this season ends, Clifford figures his playing days will come to a close. Majoring in finance, he plans to pursue a career in business after graduating. He said Chapman was an ideal environment for him from the outset, a place where he could put his primary focus on academics while still being able to be an athlete. Until graduation, he will give his utmost on the court and in the classroom, for himself and his siblings, for his father, Paul, and for his mother.